One of the principles underpinning many of the mind-boggling quantum phenomena states that there is an intrinsic limit to the precision with which we can simultaneously know certain pairs of properties of a quantum system, which are referred to as being 'complementary'. For example, the more precisely you know the position of a particle, the less precisely you can know its speed, and vice versa. In fact, the more precisely one of such properties is determined, the less certain we can be about the corresponding property – knowing the precise answer in one case only increases the challenge of getting the full picture. Getting a glimpse of the full picture then requires compromises – trading off precision in the determination of one property for more precision in that of the other. However, achieving the best possible full picture allowed by the 'trade-off' limits imposed by laws of quantum physics is a daunting task. Now University of Bristol experts believe they have demonstrated a much easier way to bypass this challenge. Their work, published in the journal Optica, could have implications for the future of information security, bio-medical science and other fields of study where sophisticated advances are increasingly relying on the ability to incorporate and measure the properties of quantum systems. The solution devised by researchers from Bristol's Quantum Engineering Technology Labs involves a specially designed optical fibre that can generate single photons in a heralded fashion, allowing them to measure one photon at a time using an elegantly simple measurement procedure based on an analogue of a coin flip. 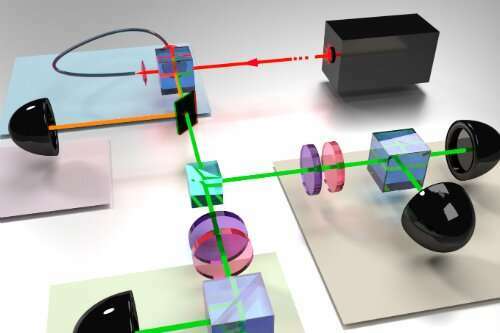 Their experiment simultaneously determined two complementary polarization properties of a single photon and achieved the best possible 'full picture' allowed by the trade-off limits imposed by laws of quantum physics. "Until we managed it, it was not well known that such quantum-limited simultaneous measurements on a single photon qubit could be realised with a basic setup in such a simple way," said Dr Adetunmise Dada, Senior Research Associate in Bristol's Quantum Engineering Technology Labs, and lead author of the paper. "Our findings shed light on the limits of how much we can learn about different complementary properties of quantum systems by using practical measurement setups. It is also related to how well we can rely on the information security delivered by quantum protocols in real world implementations, since the same principles govern the limits on the information that is hackable by an eavesdropper in quantum key distribution."